Another weekend is over and we are all back to work today! So yesterday I was supposed to be cleaning my house but how boring is that... So instead I managed to find this amazing litlle tutorial for you by Amy over at Positively Splendid. Anyone that know me knows I love my fabric and am so excited that we are now starting to stock fabrics in the shop. Therefore I felt it was only right I should bring you a little sewing project to kick start this new venture. These sunglass cases are so beautiful and would make a great little gift for a friend or loved one. 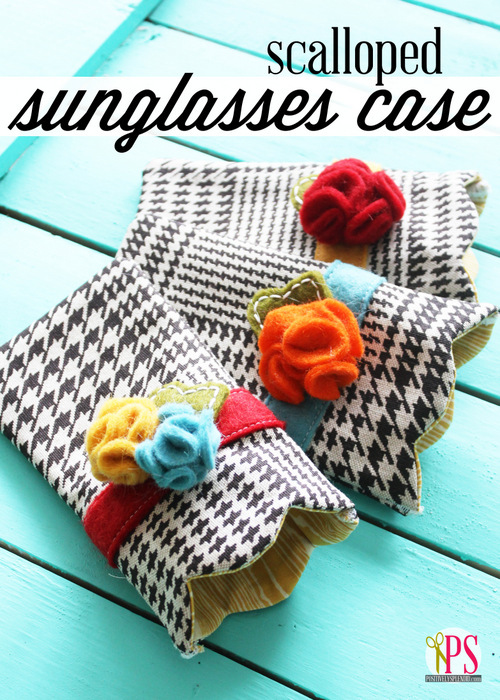 Click here to download the free PDF pattern for this sunglasses case. If you would like to see the full tutorial with instructions head over to Positively Splendid. These cute little felt flowers that have been used to embellish this sunglasses case would look great made from our brand new wool felt. I would love to here your comments from anyone who gets the chance to try this project out, I got some amazing little glasses cases as prezzies for my friends!